Crude markets took a turn lower on Monday and WTI knocked below the critical $50 level as traders continue to bet on rising US oversupply. The OPEC+ are set to start reducing oil production by 1.2 million barrels per day beginning of January, but Crude traders see little reason to start bidding on it as US production continues to ramp up far above levels that crude demand can hope to absorb. The WTI barrel has lost more than 30% since the beginning of October, trading at a 14-month low as US oil inventories and production are hammering the prices even lower heading into year's end. As expected, Crude oil prices broke below the pattern presented on the chart and printed a fresh new low at $48.5 per barrel. 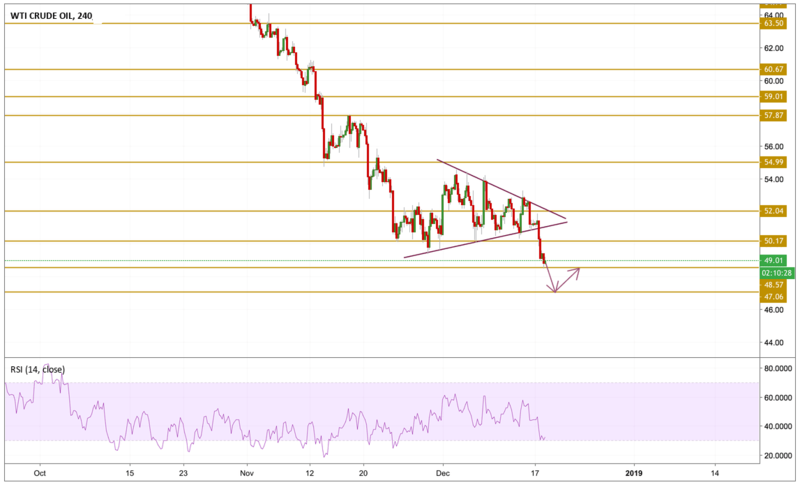 The price is currently hovering around the $49 level but momentum is still bearish and the black gold is yet to enter into an oversold state with more room to record more new lows. The level that we will be watching is the $47.06 level but we expect also some extreme buying waves if the price goes to this area.